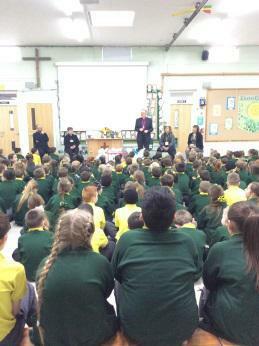 Bishop Richard of Warrington visited school on Thursday and received enthusiastic welcome from children and staff. 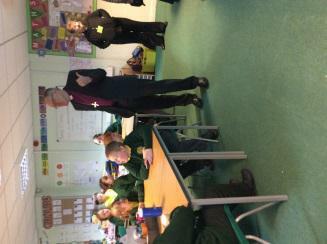 Bishop Richard was very impressed by the warmth he received from our pupils as he went around each class. During his time at school he heard exciting star poems and was given some handwriting tips! 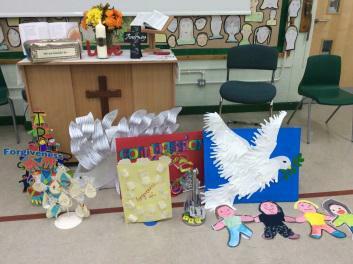 He met school council who asked him some deep and searching questions and joined us for collective worship. The Bishop was impressed at how well the children led the worship and commented on the prayers composed by the children. The Bishop said he was moved by how beautifully our children sang. A little bird had told the children it was the Bishops birthday so the worship ended with the children singing happy birthday and Celina presented him with a portrait she had drawn. 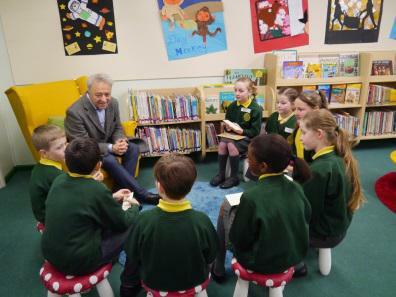 Today, our children were thrilled to be visited by the award-winning author and successful screenwriter, Frank Cottrell-Boyce. 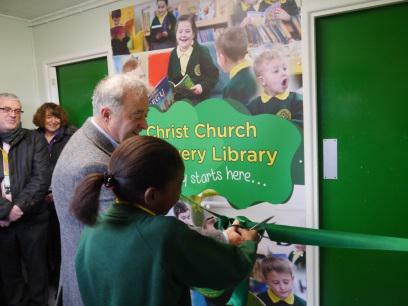 We have recently redesigned their school library to promote a love of reading and asked Frank to officially open the new library. The children who were involved in recreating the new look, chose a woodlands theme to give a calm and peaceful feel and now love to squirrel away with a book, relaxing on the ladybird beanbags, sitting under the tree or enjoying a story in the story-tellers chair. Everyone loves the new selection of books by their favourite authors, as well as a range of graphic novels, comics, magazines, newspapers and kindles. Frank took questions from the school council before delivering a fantastic assembly to the children. 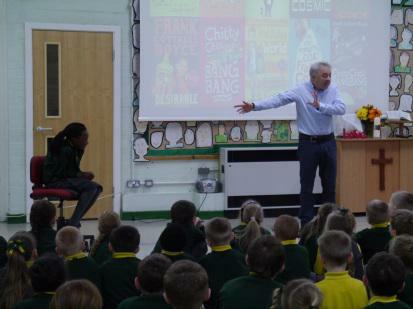 The pupils were so excited to meet the author as they have been reading a range of his much-loved books.